I first read Lisey’s Story right after it came out in 2006. We were living in Turkey and I bought it as a birthday present to myself, one that miraculously arrived on time. On my birthday my husband was working, but the day was warm and sunny, so I sat on our very noisy Bakirkoy balcony, a glass of cold white wine, and tucked into what would become one of my favourite Stephen King novels. In spite of the warmth, I was breaking out in gooseflesh as the story unfolded in ways that hit very close to home. I finished the story in a day and a half reading marathon, and in spite of only having read it the once there were so many things that stuck with me intuitively. Worlds away in Prague, re-reading the novel for the 2011 Stephen King Challenge was an even more incredible experience than the first. I took my time reading it over a January 2011 week, even forgoing my usual TV-show watching in the evenings to dedicate the time to this beautiful book. Lisa “Lisey” Landon, widow of famous author Scott Landon, begins the arduous work of cleaning out her husband’s study two years after his death. Stirring up the past doesn’t sit well with Lisey or her sisters as a series of events, some horrific, lead to her sister falling into a catatonic state as well as a madman willing to kill Lisey to get at her husband’s unpublished words. Alternating between the present, the details of Lisey and Scott’s marriage as well as Scott’s childhood, Lisey’s Story shows us the strange and inexplicable worlds of the Landons and Debushers. One of the most touching aspects of this novel is the sensation that Scott is an active element in the story, in spite of his death. Lisey speaks in many of their intimate catch phrases as a couple and while I wished some of them could have been explained better, I began to think that maybe Sai King didn’t know himself what these strange words and references meant. Something about that made Lisey and Scott’s marriage very real to me. Like when you hang out with a couple who’ve been together a really long time and it almost seems like they read each other’s minds. It can be alienating as the outsider, but it is also heart-warming (or wrenching if the partner is dead) to see such a well-tuned unit. That is one of the things that I feel makes a marriage a great one. I wondered if aspects of this novel are King’s personal nightmare about what would happen to his wife should he die. I also wondered if he conceived of this tale after he was hit by a van and very nearly did die. But marriage is not the only theme in this beautifully crafted story. The strange power of family and its hold over us is another overarching theme that bears mention. As the dynamics in Lisey’s family unfold, so do Scott’s tortured family history of madness and murder. And when Lisey’s story is finally revealed, oh man, cue the freaking waterworks. What a moving book. In The Gunslinger Jake says, “Go then. There are other worlds than this.” And he is right. The other worlds in Lisey’s Story are haunting and if you’re a dreamer like me, you might see (and feel) some familiar landscapes. I am in a water-filled grotto. The water is so clear it’s almost invisible. The ground covered with the softest underwater moss. The green is so vibrant I can taste its sweetness. The water laps at my knees. I am scared. Not because anything is scary, but because I am terrified of the water. I wait for something to brush against me. For this magical place to turn into a nightmare. It never happens. The stone walls glitter with hints of that fairy, Wendy green. I wade through an archway. A creature waits for me. Half dog, half hippo. The Hippodogamus gestures with his sweet face towards a rushing river, as if I am to go there. I am scared. I see things floating in the water. I don’t want to go in there. Hippodogamus, the size of a well-fed boxer/mastiff hybrid, jumps up on me, his paws landing on my chest. “OOOOOF!” I breathe. He’s so heavy. I grab onto him so as not to fall over. His fur is the softest thing I have ever felt in my life. Like after a dog’s hair has been shaved down, except the Hippodogamus has long hair. I want to hug him, but he pushes me towards the river. Gestures with his smiling face. I don’t want to go there. I am scared. When I wake from the dream I am confused. I didn’t realise I was dreaming. I can feel the warm water, sweet against my skin. I can feel the weight of the Hippodogamus, the softness of his fur under my hands. Does the myth-pool, the story-pool that Scott Landon/Stephen King talks about really exist? I believe so. I also believe that anyone who creates stories, or films or art has their own personal version of it where they go to fish for ideas. Lisey’s Story is more than a book. It is a passion. One with a vision you either get or you don’t. So much of this story resonated with me and I had chills the whole time I was re-reading. Halfway through I started crying and didn’t mostly stop until I finished. Man, it’s hard to read through tears. I get this story in a way that, as intimate as I can be on this blog, I will not discuss further. Suffice to say that while Rose Madder has been my favourite King novel since 1996, Lisey’s Story has blown it out of the water. This isn’t a novel that I will read as often as I do others, but I won’t need to. It’s a part of me. Always has been, even before I read it. For those in the know, Lisey’s Story is pure magic. Truth, even. King’s best and most honest work, hands down. If you’ve never been a fan of King’s horror, then this might be the book for you. The next time I find myself in the Grotto of Enchanted Waters and see the Hippodogamus, I won’t just wade into that river: I will dive. Announcing my participation in the 2011 Stephen King Challenge! 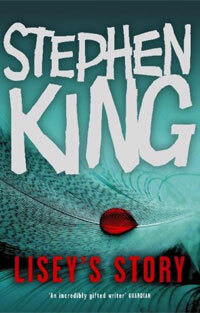 Organised by Book Chick City, read and review 6, or 12, or more Stephen King works in 2011. Get your read on! Read full post. A She Writes blog post by an African-American woman calling for “White Ambassadors To Help Me Cross Over” provokes a blog series, in which this piece is one of seven reactions. Read full post. My review of the tragic “Assassination Of Marilyn Monroe”. Read full post. Exploring the various facets of women’s literature and where my first novel, AMERICAN MONSTERS, fits into the debate. Read full post. emailFacebookTwitterPinterestTumblrStumbleUponDiggRedditWritten on a postcard with a biohazard stamp, encased in plastic: The wheel of ka never stops turning, And I roll with it. Where a stamp could go but there’s nobody to read it: Mother Abagail’s farm June 14, 2009 The apocalypse is nigh, All I can do is smile. Maybe, possibly, could be related: Read full post. Did someone drop her on her head as a baby? Read full post.